Iterable's web push offering allows you to push blast and triggered notifications to subscribers using the Chrome, Firefox or Opera browsers (Safari support will be added in a future release). Google's Firebase Cloud Messaging (FCM) service is used to deliver these messages. You can find more information about Firebase on their website. This section describes how to set up web push notifications in Iterable. Create a project within the Firebase Console. In order to send messages from Firebase, you will need to first prompt users with a message asking for permission. If permission is given, you will retrieve the user's browser token and give it to Iterable to use for future sends. Add <link rel="manifest" href="/manifest.json"/> in the <head> section of your webpage. Download manifest.json and firebase-messaging-sw.js, and place them in the root directory of your website. The gcm_sender_id 103953800507 found in the manifest.json file should be the same across all projects. Please do not edit or change this. If permission is granted, it should fetch the user's browser token and then pass it to Iterable using the /users/registerBrowserToken API endpoint. A user profile field, browserTokens, will then reflect the browser token value for each user who accepts notifications. This is an array, which is capable of accepting multiple values over time. If the user's email address is not available (for example, if the user is not logged in), you may leverage our placeholder.email convention to pass Iterable a placeholder email address with the token. Browser tokens are managed and sometimes disabled by Firebase using their own algorithm. If Firebase determines a token to be outdated, you may need to re-prompt users for web push permission. Users who have not enabled browser tokens on their profiles will be suppressed from web push send attempts. If you have collected users' browser tokens in the past, you can import them into Iterable using the same /users/registerBrowserToken API endpoint as mentioned in step 3, above. // This is how to track web clicks. In Iterable, navigate to the Integrations > Web Push. Click Create Push Integration to add a new integration. Select FCM and enter your Firebase server key and sender ID (from Step 2 of Configuring Firebase, above). The same steps apply for campaign creation as for email, SMS, push and in-app notifications: you will want to select the associated message format, seed and suppression lists, and template. More information can be found here for blast campaigns and here for triggered campaigns. Also read Iterable's documentation for the /webPush/target API endpoint. The template creation and editing process is similar to what you'll find with the other formats. Title or body contents are required in order to save the template. This acts as a safeguard against sending blank messages. Your project name will display under the title and body in the preview. In proofs and the live sends, however, this will display your website name (for example, "iterable.com"). #Does Firebase have any associated costs? No, Firebase is free (as of September 2017). #Where can I find more information on Firebase? See Google's Firebase support page here. #Which browsers does web push work on? Currently, Chrome, Firefox and Opera. We plan to support Safari in the future via Apple's Push Notification Service. #Does a user's browser token change from session to session? #If a user's browser window is closed, will they still receive the notification? Yes. Even if the user closes the browser window, the service worker running in the background will display the notification. However, if the user quits out of the browser completely (not just the window or tab), then all service workers will be killed and they will receive no notification. #Will messages be queued if they are unable to display initially? No. Messages will not deliver if the browser process isn't running at send time. #What metrics can I track with web push? We support both web push send and click events. In order to track web push click events, you must configure your website to capture click metrics. 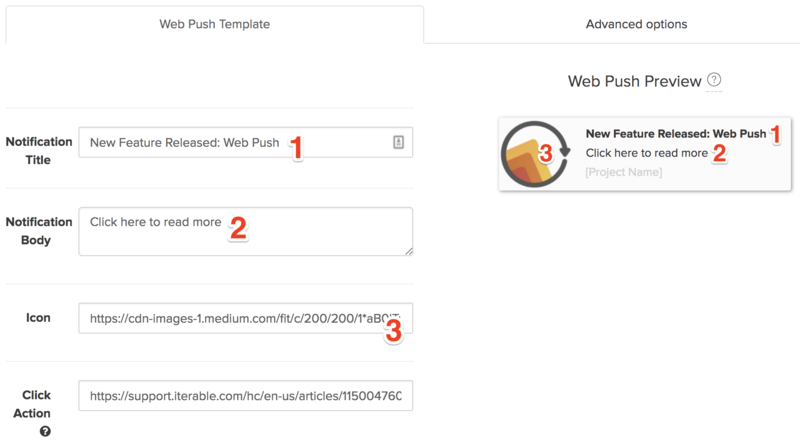 Please see above for more information on how to track web push click events.